". This is one of the earliest examples of using counting-rod numerals in writing. In 1976 a bundle of Western Han-era (202 BCE to 9 CE) counting rods made of bones was unearthed from Qianyang County in Shaanxi. [need quotation to verify] The use of counting rods must predate it; Sunzi (c. 544 to c. 496 BCE), a military strategist at the end of Spring and Autumn period of 771 BCE to 5th century BCE, mentions their use to make calculations to win wars before going into the battle; Laozi (died 531 BCE), writing in the Warring States period, said "a good calculator doesn't use counting rods". The Book of Han (finished 111 CE) recorded: "they calculate with bamboo, diameter one fen, length six cun, arranged into a hexagonal bundle of two hundred seventy one pieces". After the abacus flourished[when? 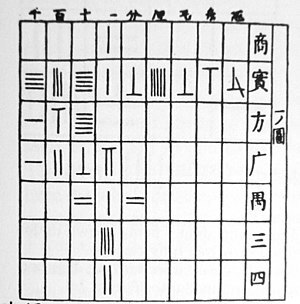 ], counting rods were abandoned except in Japan, where rod numerals developed into a symbolic notation for algebra. , with a blank space in between for obvious reasons, and could in no way be interpreted as "45"
. In other words, transcribed rod numerals may not be positional, but on the counting board, they are positional. is an exact image of the counting rod number 405 on a table top or floor. ^ Ancient China Math – Copyright © 2010 – TutorVista.com, All rights reserved.